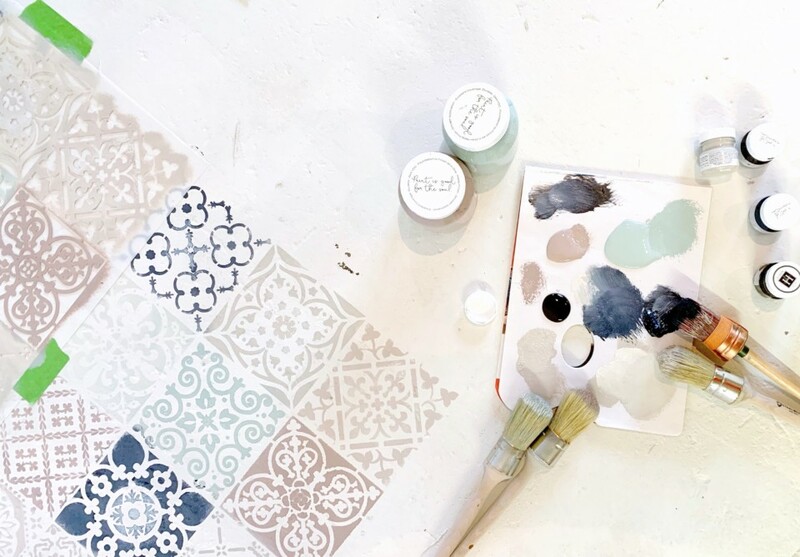 We often tell people paint has the power to transform projects in such a way that after you’re done painting, you can’t believe it’s the same room or piece of furniture. In this case we want to show you how we changed the look of an old concrete floor into something beautiful. 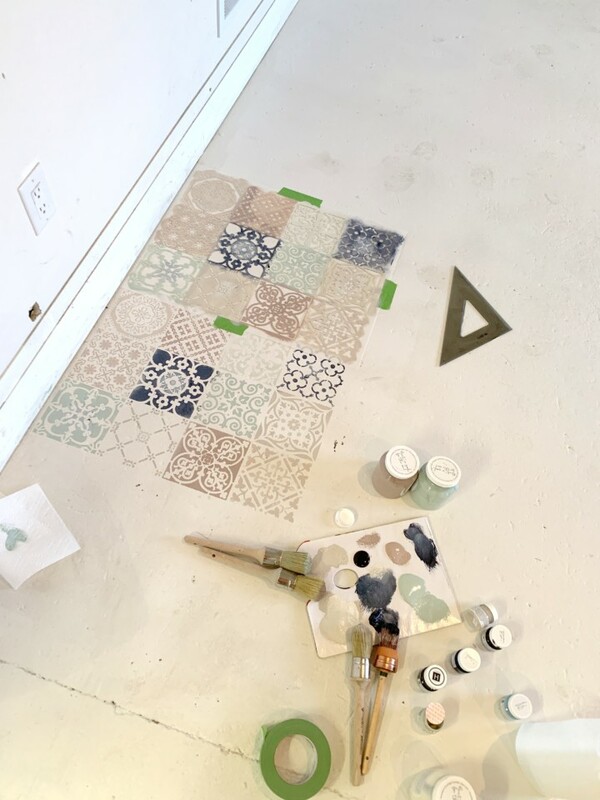 We are sharing Jennylyn’s DIY Stenciled Concrete Floor that she recently did (and people went crazy for on Instagram when she shared it in our stories! Do you follow us there?). We wanted to transform a space where we often take photos for staging and photography shoots – it was a concrete floor that had previously been painted with milk paint. 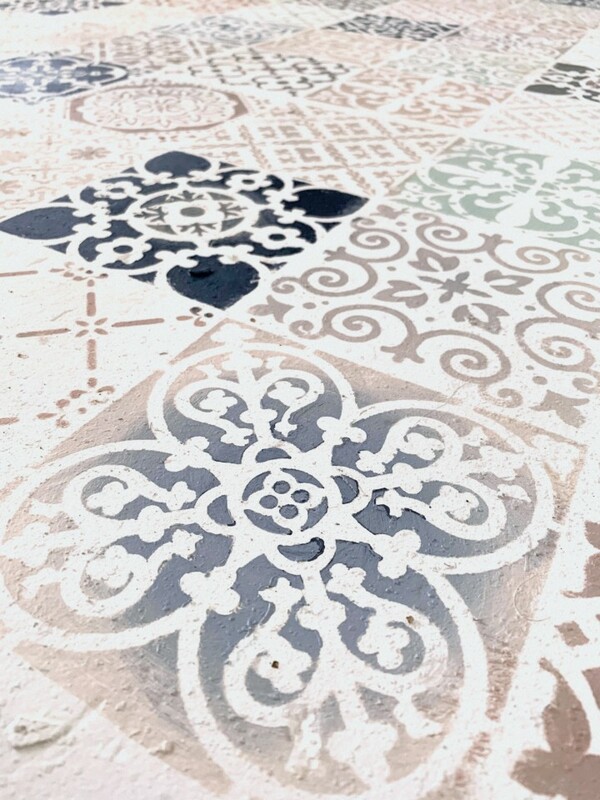 So, we decided to stencil it to create a gorgeous new stenciled floor. 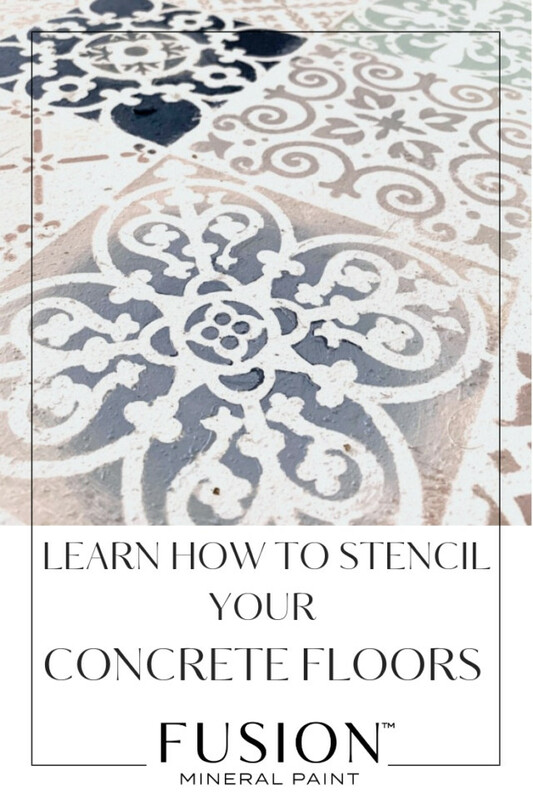 This tutorial is going to teach you How to Stencil Concrete Floors with Fusion Mineral Paint. First, clean your floors. Sweep and wash your surface to make sure it is free from any debris. Using a roller, roll out a coat of Raw Silk onto the floor and let dry, then follow up with a second coat. You do not need to use Ultra Grip before using Raw Silk to paint over concrete because concrete is porous and Fusion can soak in a bit. Hence why you’ll want to do two coats. Take all the Fusion Mineral paint colors and put them on a paper palette or surface of your choice, first in individual colors per section. You will be mixing them later so this is just an easier way to have the paint laid out ahead of time, and to avoid dirtying up your paint pots! Align your stencil with the wall and tape it down securely so it stays in place. We recommend using a Staalmeester natural bristle brush. It holds paint very well and works better for stenciling than the synthetic blend brush because the natural bristles are a little stiffer than the synthetic blend brush. With a synthetic brush, the paint glides off really well – which is great when you’re painting a large surface, but not so great for stenciling, since you want to use minimal paint to avoid paint “bleeding” under the stencil. 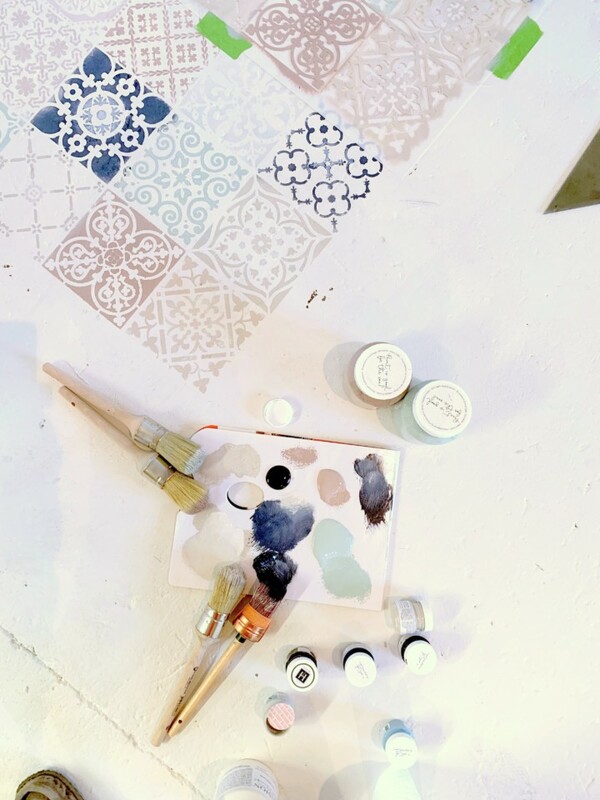 We used three different brushes for our DIY Stenciled Concrete Floor – one for dark paint, medium paint and the last one for light colors. Starting with the single color square stencil, put on a small amount of paint on a brush, just enough to cover the tips of the bristles. Then dab some of the paint onto a paper towel so that there is almost no paint left. The reason you want to do this is because too much paint can potentially cause smudging or bleeding. Afterwards, pounce (dab) or swirl to apply the paint over the stencil, doing a bit of a dry brush technique. For the additional colors, blend them by overlapping them on the squares or by dipping into two colors before applying the paint. We tried to be a touch random with colors but also were conscious of not having an large area of just light or dark paint and made sure not to have two of the same colored squares together. Putting the stencil in the next location was a little tricky as we needed to keep the space between the “tiles” (the stencils) consistent. We recommend making “registration marks” which are little triangles at the edge of the stencil that help you line it up. For those that are unfamiliar with stencils, they sometimes have markings on them in the form of little arrows/triangles to help guide you on placement from one stencil to the next.. So if yours don’t have that, making your own is helpful for consistency. We also used a set square – a triangle measuring tool to help try and keep things straight and it worked pretty out well. We did not add Tough Coat over this as for us it’s not a high traffic area and mostly used for staging photographs. 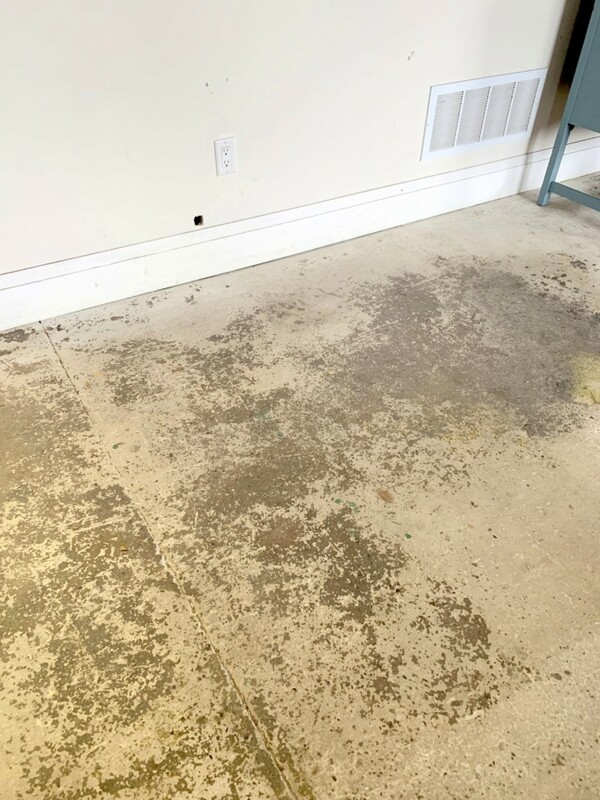 If you, however, are doing a mud room floor or bathroom that is going to see a lot of water, you’ll definitely want a couple of layers of Tough Coat or some Stain and Finishing Oil in Natural to protect it. One thing to make note of for any painted floor, pools of water need to mopped up ASAP because if they’re left there, they could swell the paint and lessen the durability. And there we have it! 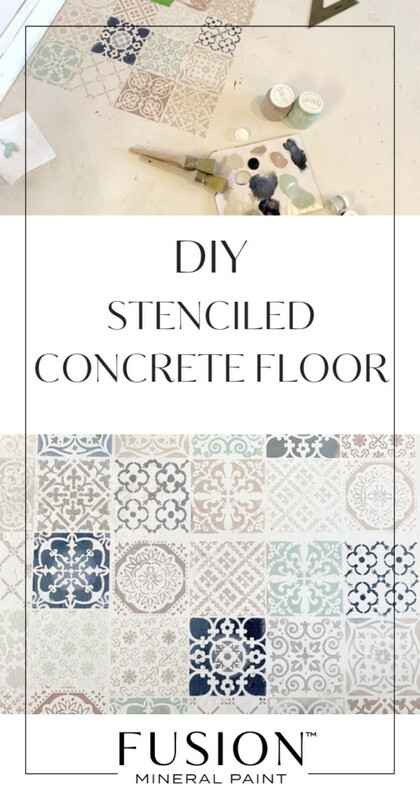 A gorgeous, DIY Stenciled Concrete Floor! Perfect for photo shoots or even a creative way for someone to brighten up an old environment. 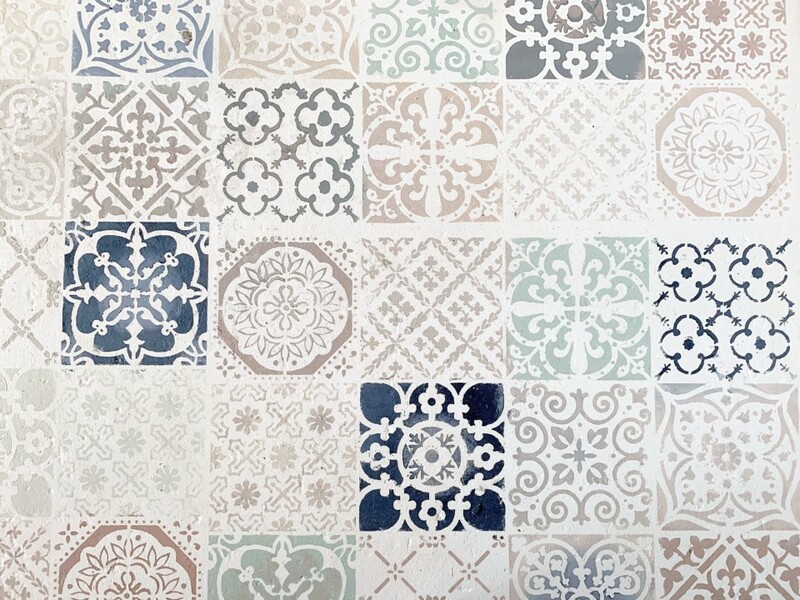 Have you ever stenciled or painted a floor? If you have we would love to see it so please do share it with us in our Paint it Beautiful Facebook group!